If you want to look cool and remain cosy, reach for a charcoal check wool blazer and gold earrings. For something more on the daring side to finish off this outfit, rock a pair of multi colored athletic shoes. 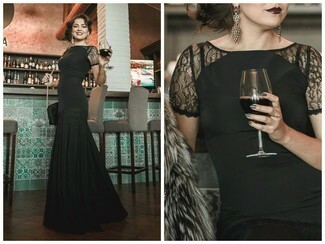 If you're on a mission for a casual yet totally stylish look, go for a black lace evening dress and gold earrings. Both pieces are totally comfy and will look fabulous paired together. We all seek comfort when it comes to dressing up, and this combination of a black turtleneck and Jules Smith Designs jules smith willow drop earrings is a great example of that. You could perhaps get a little creative in the shoe department and spruce up your look with black embellished suede heeled sandals. If you're all about functionality dressing when it comes to your personal style, you'll love this absolutely chic combo of a red pleated casual dress and Jules Smith Designs jules smith willow drop earrings from Nordstrom. Lift up this outfit with black suede heeled sandals. 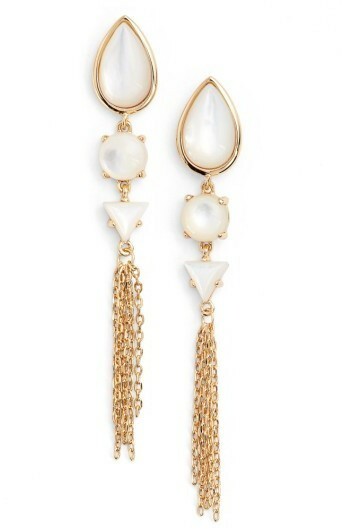 We all seek comfort when it comes to dressing up, and this combination of a white button down blouse and Jules Smith Designs jules smith willow drop earrings from Nordstrom is a good illustration of that. If you're all about feeling relaxed when it comes to fashion, this combination of a tan crew-neck t-shirt and gold earrings is totally you. Amp up the cool of your look by rounding it off with beige leather heeled sandals. We're all seeking comfort when it comes to dressing up, and this combination of a beige print open cardigan and Jules Smith Designs jules smith willow drop earrings from Nordstrom is a practical illustration of that. Wearing a pair of black leather heeled sandals is a simple way to add some flair to your look. If you're all about practicality dressing when it comes to fashion, you'll love this totally stylish combo of a white silk button down blouse and Jules Smith Designs jules smith willow drop earrings from Nordstrom. And if you want to instantly up the style of your look with one piece, add grey canvas wedge sandals to the equation. If you're obsessed with comfort dressing when it comes to your personal style, you'll love this adorable pairing of a navy velvet double breasted blazer and Jules Smith Designs jules smith willow drop earrings from Nordstrom. Perk up your getup with brown leather knee high boots.